OK. So you finally accept the fact that tithing is not required because we are no longer under the Law, but, you still believe we should tithe because of Abram’s tithe. You’ve been taught that Abram modeled or gave us an example of what we should be doing as far as our giving. When we study everything about the incident we will see that Abram’s actions are not an example for us. 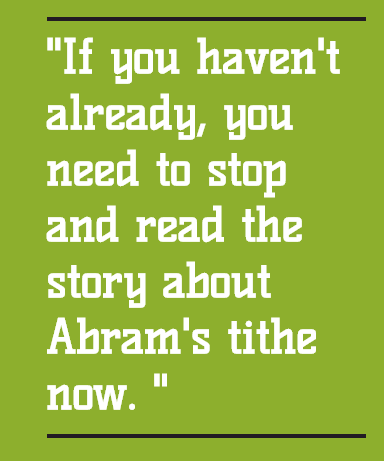 If you haven’t already, you need to stop and read the story about Abram’s tithe now. (Gen 14:11-24). Even if you think you already know the story, you still ought to read it for yourself. For some of you, just reading the story for yourself allowed you to notice some things about the story that you did not notice before. Verse 12 gives us the reason that Abram went after the four kings. His nephew, Lot, was carried off with all the lawless people of Sodom and Gomorrah. Lot was not guilty of the sins that the people of those two towns were committing. Lot is referred to as a ‘righteous man’. Abram immediately made up his mind to go rescue his nephew Lot. As a side issue, I have listened to very effective preachers preach about Abram’s victory over the 4 kings with only 318 men. Those were very moving sermons and I got excited just like everybody else. Very exciting, but, his getting the victory with only 318 men was absolutely wrong!! It wasn’t just 318 men that went after the four kings to rescue Lot. Verse 13 tells us that Abram had some allies. These allies and their men went also. The allies are referred to the same way that the kings are referred to in verse 11 and earlier. The Bible tells us that ‘four kings seized all the goods …’ It wasn’t just 4 guys on horseback with robes and crowns. It is talking about their armies. The same is true of the 3 people named in verse 13. There were those three and their armies or the men in their households. This is supported in verse 24. Abram’s allies went with him into battle against the 4 kings and Abram wanted to make certain that they got the reward they were due. So how many men went with Abram to rescue Lot? I don’t know. It was more than 318 and it was certainly more than 321. The actual number is not important. It was a stunning victory regardless of the actual number that took part in the battle. Back to the main issue. On Abram’s return from victory over the 4 kings he was first met by the king of Sodom. It seems like it may have been a 3 way meeting including the priest Melchizedek. Whether the three of them were standing in one place at the same time is not important. What is important is what was said by each person. Melchizedek blessed Abram in verse 19 as he recognized that Abram’s victory was because God had ‘..delivered your enemies into your hand.’ Abram gave Melchizedek a tenth or tithe of everything he got from the 4 kings. The word ‘everything’ is explained further in the book in Hebrews. Abram gave him a tenth of everything he plundered back from the 4 kings that had plundered Sodom and Gomorrah and had taken all the people and Abram’s nephew Lot. The tenth or tithe was a portion of what Abram had at the time. It was not a portion of everything that he owned. 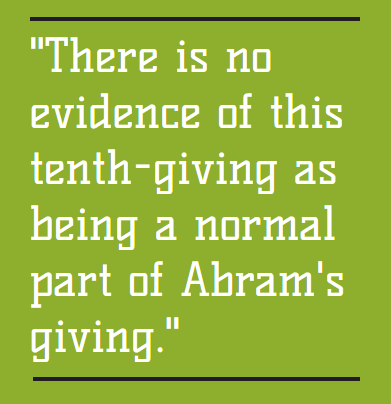 There is no evidence of this tenth-giving as being a normal part of Abram’s giving. It was a one-time event. Was God speaking to Abram in some unrecorded mysterious way? Absolutely not! Abram was free to do basically whatever the local traditions would allow or require. According to the King of Sodom, it was OK – verse 21 – for Abram to keep all the goods and valuables for himself. At that point, Abram shared with the king of Sodom about the oath he (Abram) had previously taken – verses 22-24. Abram had already decided that he personally was not going to accept anything at all from the king of Sodom. Abram didn’t consider the plunder to be his own. So from what he did not even consider his own, Abram gave Melchizedek a tenth of that amount. Abram insisted that his allies get the portion they deserved and that was the end of it. The Bible doesn’t tell us where the balance of the plunder went. It seems it went either to the king of Sodom and/or back to the people who were originally plundered. Abram’s gift to Melchizedek was simply a gift. God had no written Law in effect and there is no evidence that God whispered ‘pay a tithe’ in his ear to set a standard for the New Testament church to follow. Abram’s gift was clearly a one-time spoils-of-war event. Abram and Lot both were already prosperous. Abram did not tithe his way into prosperity. He was prosperous because God said he would bless him (Gen 12:1-3). Abram did not have to pay God to get the blessings promised. God told Abram that he would ‘… be a blessing’. According to Gal 3:13-14 that same blessing is available for us now. Unfortunately the church has believed for too long that we have to somehow pay our way into getting God’s blessings by tithing or by sowing. We get some of God’s blessing in our lives by having faith in Jesus Christ and NOT by having faith in our ‘tithing’ or faith in our sowing. Abram’s gift to Melchizedek did not come from money or resources that Abram claimed for himself. In other words, he gave away ‘other folks money’! His personal valuables were safely at home. There was nothing wrong with what he did. Remember that the king of Sodom said that Abram could have all the valuables and also remember that Abram refused to accept anything from the king for himself. Melchizedek merely reminded Abram that God gave him the victory. The ‘preacher’ in this instance did not give a sermon about how much Abram was to give! Some try vainly to prove that Melchizedek was actually Jesus and claim that is why we should tithe. I won’t get into that debate because whether it was or was not Jesus does not dictate what amount of giving God would be pleased receiving from you and I now. Yes, Abram’s gift to Melchizedek is an example for us to follow, but, NOT an example of how we are to tithe. Instead, it is an example how to give a gift. He was free to do anything he wanted and he decided on his own to give a tenth. Abram’s gift appears to be an excellent example of what Paul wrote about in the New Testament. Abram decided on his own how much he wanted to give. YOU should decide for yourself how much you want to give. Pray and ask God to help you set aside all the sermons you have heard that make you feel guilty for not ‘tithing’. Forgive the people that taught you that you will be cursed if you don’t ‘tithe’. Not all of them were trying to mislead or plunder you.